Children’s writers in my audience are probably groaning right now, because this is a question we’ve all been asked at least once. Most of us come back with an expression of comically-exaggerated confusion and something along the lines of “As opposed to all of the imaginary ones?” Inside, though, we are typically seething with rage or welling up with existential despair, because what the questioner really means is “When are you going to write a book for adults?” The implication, of course, being that books for kids are in some way lesser. Or at least, of lesser importance. I argue, however, that books for kids are actually MORE important than books for adults. In case you missed it, the bottom line is that people (read: adults) are terrible judges of the scope and validity of our own knowledge. Those of us who know the least about a topic are convinced we know the most… and therefore are the most resistant to new ideas on the topic. This is not a problem with (most) children and teens. Kids are completely aware of the fact that they don’t know everything – and what’s more, they are hungry to learn. Even kids that say they don’t like school tend to be voracious consumers of data on the subjects they do care about. And if you show kids why information is interesting or relevant, you can get them fired up to learn about just about anything. Case in point – the grade 7s and 8s at the local school I visited on Friday. 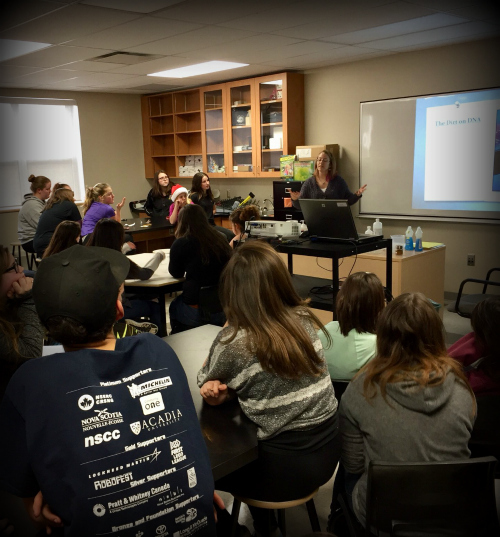 We had a fabulous discussion about forensic science, during which the kids not only paid rapt attention, but asked cogent questions that showed they were connecting the new info I was giving them with things they already knew. Several of them thanked me afterward for the cool presentation, or told me that they want to be scientists when they grow up. Those are the kinds of impacts that only children’s writers get to have – more than any other kind of writer, we have the power to open minds to new ideas. We do school visits because it’s absolutely thrilling to watch those sparks ignite in real time. And that is why I will (probably) never write a book for adults. What about you? What were your favourite factual obsessions as a kid? What books do you still remember reading, and how did they shape the person you are today? If you write fiction, they ask you that, too. Wow, this brought back memories! My favorite book for several years was a big paperback with a red and blue cover called Hobby Fun Book. It was filled with home experiments, and I made or did them all! Simple things that opened up all kinds of new ideas. Water tension? I floated a needle on a dish of water. I sprinkled talcum powder to see it float, then touched a bar of soap to one side and watched as the talcum drew rapidly to the far side. I pushed an upside-down glass into a bowl of water to see the level go down inside and up outside it. I made moss gardens and terrariums, sprouted seeds and cuttings, and fed food coloring to flowers to watch the color rise in the stems and petals. I sprinkled salt on ice to see it melt and grew sugar crystals on string. I made paper boats and handkerchief parachutes. I’ll stop now, but I bet I remember every activity from that magical book! And I still love discovering new things about the world to this day. That sounds like an AMAZING book, Paula! I remember a pocket-sized tome I got at a school bookfair. Can’t remember what it was called but it was filled with random science facts and true stories about animals doing awesome things. I DO remember that it fell apart from re-reading!